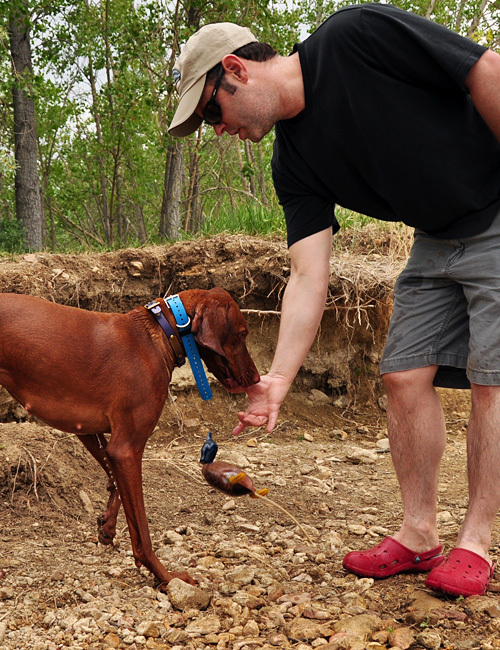 The first photo shows Amante (CH Boulder’s Bolder Amante SH – who is now testing for her Master Hunter title and competing in Gun Dog Stakes) releasing the dummy on Aaron’s command. It’s possible Aaron gave the release command too soon and so the dummy fell to the ground instead of into Aaron’s outstretched hand. Not pictured is what happened next. Aaron stood back up and asked Amante to fetch the dummy lying at his feet. Sure, he could have easily bent down and picked it up. After all, it was his mistake–not Amante’s, right? Perhaps. We would need an audio recording to go along with the photo. It’s also possible Amante was anticipating the release command and tried to be one step ahead, releasing the dummy just before Aaron actually gave the command. She can be such an overachiever! ;-) It would have been a big no-no in retrieve training, had Aaron picked up the dummy. By doing so, he would have taught Amante that he (or any other person she retrieves to) would pick up an object that didn’t make it “absolutely to hand”. Instead, by asking Amante to retrieve the dummy, he could reinforce the “fetch “command (meaning fetch can be “pick it up right there at my feet” or “go out 100 yards and pick it up”) as well as the “hold” command (meaning do not release the object until the release command is given). 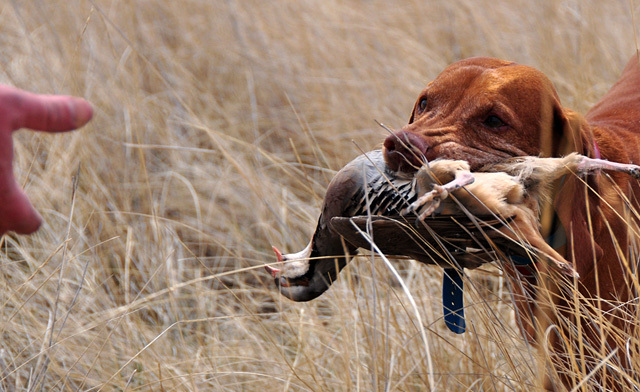 Vizsla Kosmo retrieves the dummy "absolutely to hand" (as a finished gun dog should).